“Ahead of Moreno’s visit to London, his national secretary of political management, Paul Granda, asserted on July 19 that “there is no specific meeting planned on Assange.” The same day, acting Ecuadorian foreign minister, Andres Teran, claimed that Moreno’s government is “not in talks with the United States” over the WikiLeaks editor. These statements have no credibility. All evidence points to the opposite conclusion: A conspiracy is well advanced, involving the US, British, Ecuadorian and Australian governments, to have Assange hauled before a show trial in the US. Underscoring Moreno’s complicity in the persecution of Assange, his aides announced he has no intention of visiting the embassy whilst in London to even check on the well-being of a persecuted journalist his government is nominally providing political asylum. boatloads of links, related solidarity movements, legal defense fund , etc. 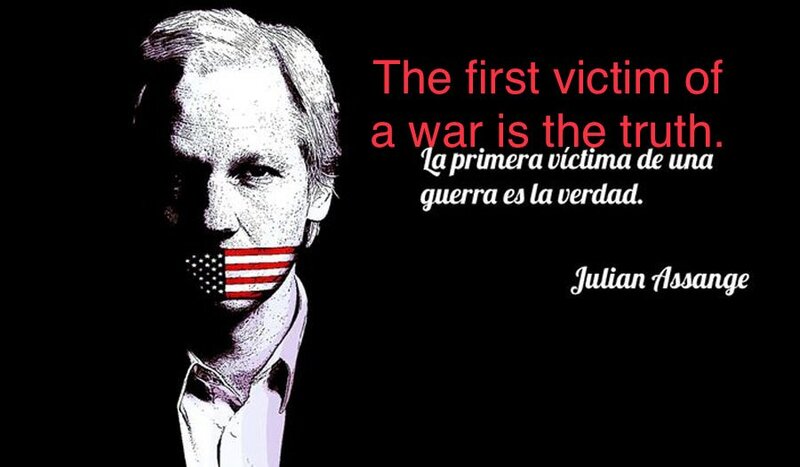 “The immense danger Assange faces was underscored yesterday by comments made during a media conference held by UK Foreign Affairs Secretary Jeremy Hunt and Australian Foreign Minister Julie Bishop, who is in Britain at the same time as Moreno. This entry was posted in WikiLeaks & other leaks and tagged end stage of the war on assange. Bookmark the permalink. Ecuador’s President Lenin Moreno traveled to London on Friday for the ostensible purpose of speaking at the 2018 Global Disabilities Summit (Moreno has been confined to a wheelchair since being shot in a 1998 robbery attempt). The concealed, actual purpose of the President’s trip is to meet with British officials to finalize an agreement under which Ecuador will withdraw its asylum protection of Julian Assange, in place since 2012, eject him from the Ecuadorian Embassy in London, and then hand over the WikiLeaks founder to British authorities. Moreno’s itinerary also notably includes a trip to Madrid, where he will meet with Spanish officials still seething over Assange’s denunciation of human rights abuses perpetrated by Spain’s central government against protesters marching for Catalonia independence. Almost three months ago, Ecuador blocked Assange from accessing the internet, and Assange has not been able to communicate with the outside world ever since. The primary factor in Ecuador’s decision to silence him was Spanish anger over Assange’s tweets about Catalonia. you know that ‘reason’ does ring a bell. spain makes sense for sucking up. yeah, he claimed that he shut down julian’s communications since ‘he’d broken the agreement’. what a creepy little neoliberal prick toady he is. remember too that he’d signed a military memo of understanding w amerika, too. llight bulb: there was a Tweet on the wikileaks acct. in spanish, w/ some fancy bobby or other leaning over to salute moreno in his chair. and me, with my four years of so-useful french…ay yi yi. for julian, for all of us, this talking poetry by john trudell, AIM chairman for a couple years, occupied alcatraz and wounded knee. his family was burned alive for his troubles, but oh, would that truth-teller have loved you. let this serve as our lullaby tonight. winging love, prayers, and strongest wishes for you life…and for your safety. When you get right down to it, anyone who participates in the ongoing smear campaign against Assange and Wikileaks is really just saying "It is right and appropriate for extremely powerful people to be able to lie to us whenever it's convenient for them." ““Both the Washington Post and The Intercept stated that they had censored the name of the victim country at the request of the US government. Such censorship strips a nation of its right to self-determination on a matter which affects its whole population. An ongoing crime of mass espionage is being committed against the victim state and its population. By denying an entire population the knowledge of its own victimisation, this act of censorship denies each individual in that country the opportunity to seek an effective remedy, whether in international courts, or elsewhere. More than 11,000 messages from a Twitter group used by WikiLeaks have been posted online in full, exposing private chats between 2015 and 2017. The messages, released in full for the first time on Sunday, have been referenced by U.S. media outlets in the past. In February, The Intercept first reported some key excerpts, including one snippet showing criticism of Hillary Clinton and support for the GOP. “[Clinton’s] a bright, well connected, sadistic sociopath,” the WikiLeaks account said in November 2015. The cache was published by national security researcher Emma Best, who broke out some key points in blog posts last week, including alleged anti-Semitic remarks. Best—who has clashed with WikiLeaks in the past—said the information was needed to provide “context” to news reports. The release was redacted in parts to protect the privacy of some named individuals. zounds, greyson; if that ain’t a hellish pile of iron-clad innuendo. chat rooms denizens are…wikileaks agents? i love how referencing the same hits at the daily beast and ‘the intercept’ allow for some patina of fake leftiness or something. i followed some of the subtweets of this around (click it to see them, as you likely know), and this emma best is a real piece of work. 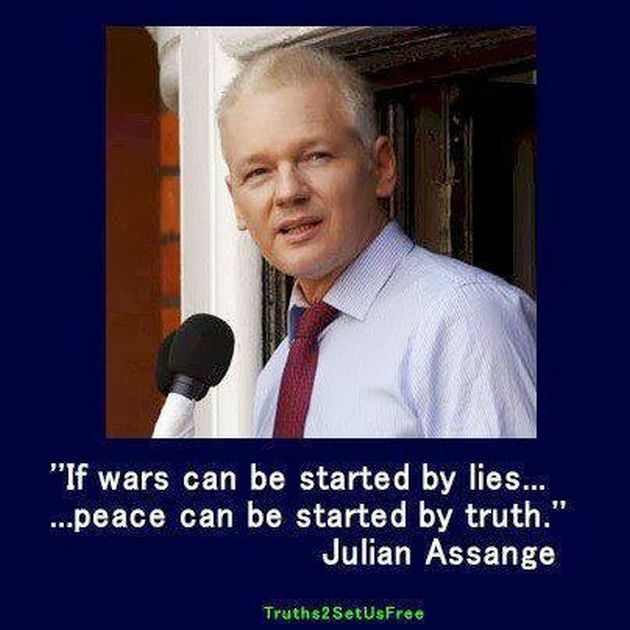 “In an interview Monday with the Spanish daily El País, during an official visit in Madrid, Moreno said Assange would have to accept that, as soon as he steps outside the embassy, he will be jailed for supposedly skipping bail when he was granted asylum in 2012. By “right to life,” Moreno evidently means just a US promise not to execute Assange. Seemingly, Moreno has no qualms about Assange being thrown into solitary confinement, possibly for life, which would be an effective political death penalty. Moreover, any assurance against execution would be worthless given the brutal record of US imperialism. When Mike Pompeo, now the US secretary of state, was CIA director last year, he directly accused WikiLeaks of being a “hostile intelligence service.” Under the US Espionage Act such activity can be subject to the death penalty.